This song is by Burns, of course; its supremely jolly tune can be heard all over youtube, but I'm partial to this version. It has seemed appropriate over the last few sunny days of September, with their fiery twilights. I love this song, which was written by 'A. C. Macleod', i.e. Annie Campbell Macleod, i.e. 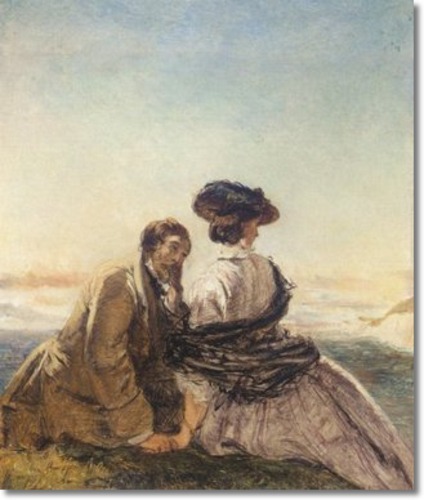 Lady Wilson, who collected the tune of the Skye Boat Song while being rowed across Loch Coruisk. I'm informed that 'Mhairi bhan og' means 'Mary my fair'. Gin ye are but left by my side. And I to the ane I love best. I'll follow thee soon to the grave. And love is the light o' thy life. This is such an amazing poem. Evening strains to be tíme’s vást, ' womb-of-all, home-of-all, hearse-of-all night. He was tired, so men said, of the delights of the world, in which misfortune had overtaken both him and his brother. For it often happens that the noble spirit is warned by the disasters of life to turn its attention more towards God, who knows not how to be disappointed or to disappoint. No doubt the highest virtue is to want the good for its own sake, but the second level of virtue is to be able to be compelled to do it, so that, in my opinion, people think as highly of Paul, who was driven to the good by the lashes of the whip, as of Peter, who willingly and without delay ran towards his master when he called him. William of Malmesbury, Gesta Pontificum Anglorum, ii.84, trans. David Preest (Woodbridge: The Boydell Press, 2002), p.123. They date, I think, from c.1180, so they weren't there in William's time (he wrote the Gesta Pontificum c.1125). Although I once heard it, I have been happy to forget it, since it is no part of a free-spirited man to jeer at the troubles of others. How many historians would say the same! 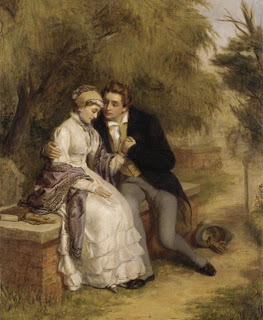 This is a song called 'Turn ye to me', by John Wilson (1785-1854), a Scottish poet who wrote under the pseudonym Christopher North (and who was, I see, a Magdalen man). You can hear the lilting tune here. Apparently "Mhairi dhu" means "Mary dear" - but I can't vouch for that or anything; my Gaelic is of the non-existent variety. Today felt very autumnal, and so here's a harvest hymn. It's usually sung to one of Arthur Sullivan's insane-though-wonderful hymn tunes, in this case 'Golden Sheaves'. The words are by William Chatterton Dix; verse 3 is my favourite. A picture from the nicest harvest service I ever went to, which took a very literalist approach to decoration. Bitter wo for my name. Pearsed once to the sky. While her fame was far blowen. * cf. Shakespeare: 'Bare ruined choirs, where late the sweet birds sang'. "She chose for herself as her plenipotentiary intercessors those senators in the starry regions, those members of the heavenly Upper House, the apostles, as being the fellow country-men and women and friends of God, and with the confidence and importunity of the Canaanite woman she harassed the Lord through them." Translated in Writing the Wilton Women: Goscelin’s Legend of Edith and Liber confortatorius, ed. Stephanie Hollis, with W. R. Barnes, Rebecca Hayward, Kathleen Loncar, and Michael Wright (Turnhout, 2004), p.34. I love that - "the heavenly Upper House!" I don't have access to the original Latin, so I don't know if a little of this is the translator's (very admirable) whimsy, but it is very much in Goscelin's style. It seems appropriate for today, the feast of St Matthew the Apostle. I can't resist mentioning that I've written before about Goscelin's love for Wilton and my belief that his work may have influenced C. S. Lewis. 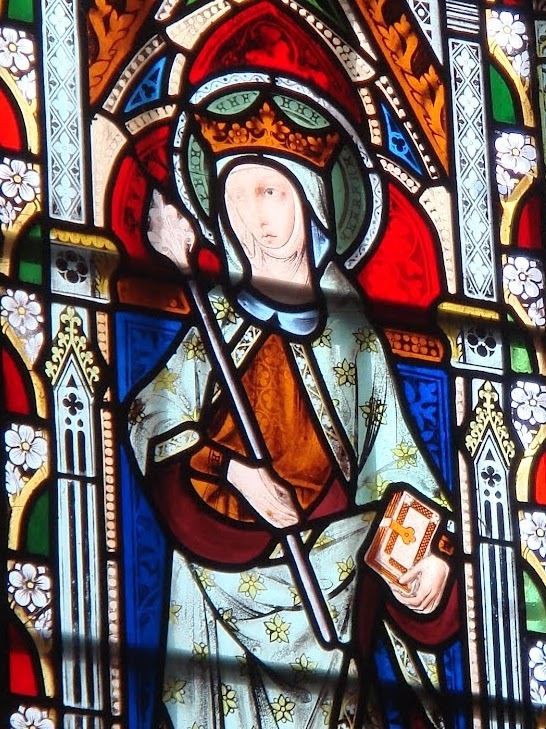 His lives of saints are extremely interesting, and it's partly thanks to him that we have information about Anglo-Saxon saints, like Edith, who would otherwise be difficult to trace. These pictures are from the church of Kingsdown, near Faversham in Kent. They're Victorian, but the reason they look so medieval is because the church - which is beautiful but very remote and which, when I went there a few weeks ago, was inches thick in dust - was designed in its entirety by Edward Welby Pugin (the son of Augustus). 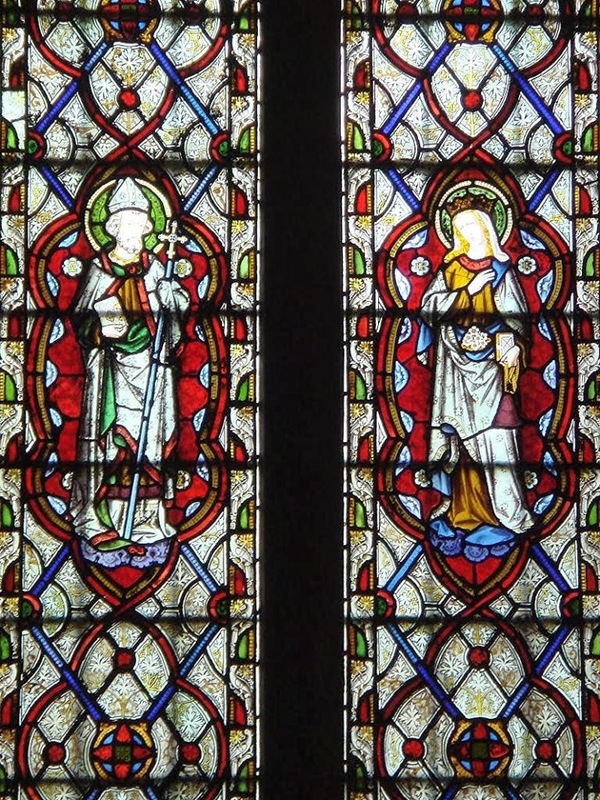 In face and hair they deserve comparison with the Anglo-Saxons depicted in the Pugin church at Ramsgate, but they are in fact apostles: from the top, Matthias, Bartholomew, Thomas, James the Great, Simon, and James the Less. That thus is marred in mournyng? Hire bende browen that bringeth blisse. 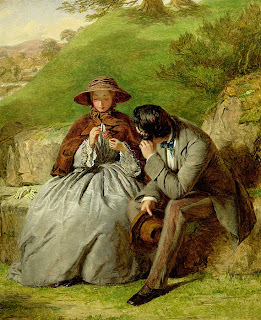 Wo-se wole of loue be trewe, do lystne me. As you can see, the rhyme-scheme of this poem, although smoothly handled, varies apparently without reason in verses 6 and 9; it's been suggested that the verses have somehow got out of order at some stage in the manuscript copying, and that perhaps verse 7 (beginning 'Herkneth me', a common opening to a poem) was originally supposed to come first. While I can make songs. I attribute to a woman. Who is so mired in mourning? Would be full of joy! 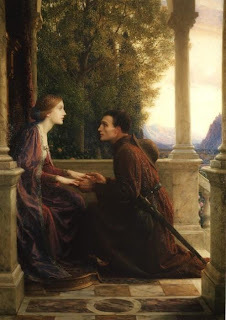 He who will be true in love, listen to me. I would like to be hidden. This is a pretty little song by William Holder; here's the jolly tune on youtube. Lassie, would ye lo'e me? Lassie, though I lo'e ye? Oh, if I were a baron's heir, and I could braid your hair with gems, and make you as smartly dressed as you are beautiful, lassie, would you love me? And if I could I take you to the town, and show you many fine sights, and dress you splendidly in a silken gown, lassie, would you love me? Or would you be content to prove your unfading love in a lowly life, with a heart that nothing on earth could move; lassie, would you love me? And before the lark takes to the sky, tell me, would you go to the forest? Would you work with me so merrily? Lassie, would you love me? And when the bright moon glistens over our little bit of shelter and the heathery moor, will you not cry because we're so poor, lassie, though I love you? For I have nothing to offer you - no gold from the mine, no pearl from the sea, nor am I come from a noble family, lassie, but I love you. Today, September 14, is the Feast of the Cross, and so here's a story about a cross which I absolutely love, from the annals of Waltham Abbey. 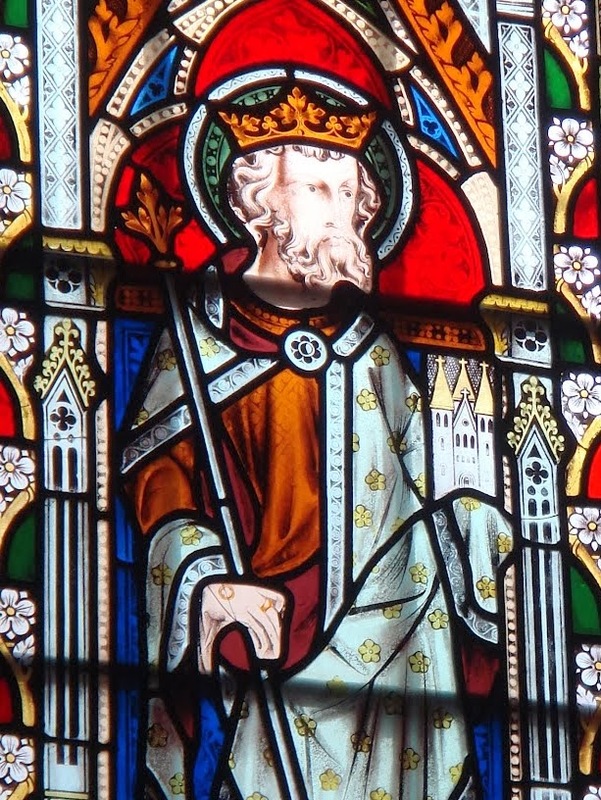 Waltham Abbey, in Essex, is the reputed burial site of Harold Godwinson, who was its patron; but before he came along, their patron was a certain Danish nobleman named Tovi 'the Proud'. 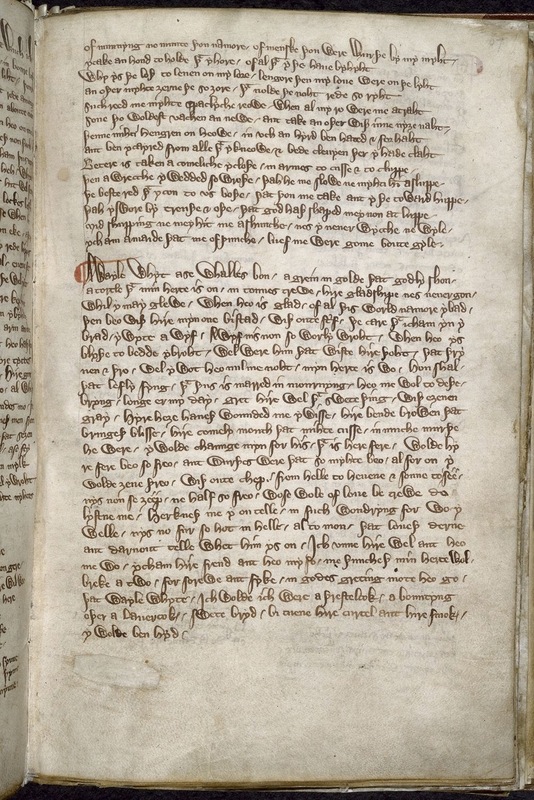 Tovi was a wealthy and powerful member of the Danish aristocracy in Cnut's England, so this story must have taken place sometime between 1018 and 1035. Waltham Abbey's own historian, writing in the 1170s, describes how a blacksmith at the village of Montacute (then called 'Ludgersbury') in Somerset had a dream in which an angel told him to climb a nearby hill and dig, and he would find a cross buried there. On his wife's advice, the smith ignored this dream (never a good idea), so the angel came a second and a third time, and the third time it roughed him about a bit, leaving finger-marks visible in his arm; this convinced him that he'd better start digging, and so he did. 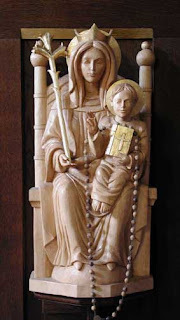 The rest of the village went up the hill to help him, and there they uncovered a remarkable treasure-trove: a life-size figure of Christ on the cross, carved in a kind of black marble, and with it a little bell and a Gospel-book. He rose early and after the celebration of divine service, surrounded by a band of leading men he decided, with the consent of all these men, to leave the smaller cross there in the local church, and take the other relics around to places where they knew it would please God. They put them in a wagon to which they harnessed twelve red oxen… Finally the clergy and all the people prayed that God would give the spirit of wisdom to Lord Tovi that he might send these present relics to wherever God willed. Tovi then promised them to Canterbury, the seat of the archbishop at that time, to Winchester, Glastonbury, and London, as well as to other places in England where there were seats of bishops or abbots. The cart stood still as if rooted there, and it could not be moved either by the pulling of the oxen or the pushing of the men. Remembering at last an abode of his which he was very fond of at Reading, he prayed to Christ with many tears that He be pleased to grant the removal of the relics to that place… But the wagon stood still; it was pushed, it was pulled, yokes of oxen were added to the animals in front, but it did not move. Those who were there looked on in astonishment, convinced that this was not happening without the providence and will of God. The high and noble Tovi continued with prayer after prayer. In naming places he moved from the more important churches to those of less importance, but he was not heard because God in His profound wisdom decreed those relics for another place which He deemed more worthy of the benefit of the gift. At last he remembered a lowly hut which he had begun to build in a woodland region which is now called Waltham, a pleasant place surrounded by luxuriant woods, provided with a river full of fish which is called the Lea; its picturesque, fertile meadows made it a delightful spot. It was quite close to London and near the River Thames of which the Lea is a tributary. His original estate which he had already begun he decided to extend within a wider boundary if God willed that the relics be transported to this place. Marvellous to say! more marvellous to believe! when he had mentioned the name of Waltham the wagon instantly moved, so that you would have thought that the cart was pushing the oxen rather than the oxen themselves pulling the cart. The hearts of the faithful were stirred with joy, and following the image of the crucified one behind their happy leaders, they rejoiced in the successful outcome which God had wrought and in the gift bestowed upon the weary. The Waltham Chronicle: an account of the discovery of our holy cross at Montacute and its conveyance to Waltham, ed. and trans. Leslie Watkiss and Marjorie Chibnall, Oxford Medieval Texts Series (Oxford: Clarendon Press, 1994), pp.15-19. I like the idea of Tovi listing place after place, getting more and more frustrated, until at last, finally! he hits on Waltham. The abbey of Waltham was established to look after the cross (so the story says; it probably already existed in some form) and thereafter the cross and figure of Christ remained at the abbey and were a pilgrimage destination. 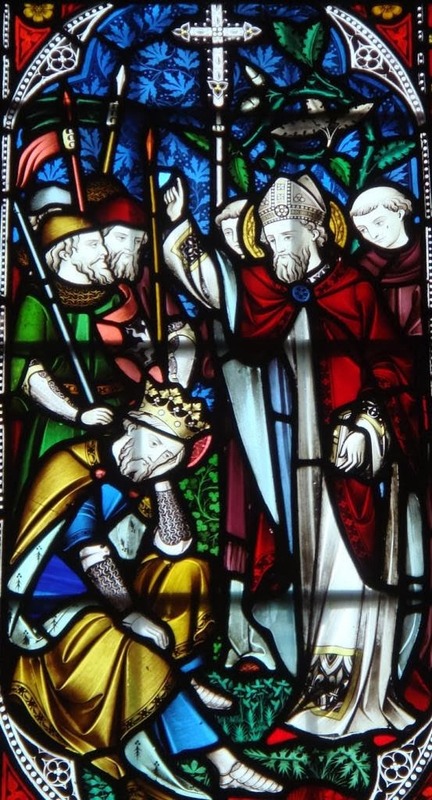 A later story said that figure miraculously bowed its head when Harold Godwinson prayed before it on the eve of Hastings, and that after his death its head remained ever bowed in grief (God was on the English side at Hastings, whatever the Normans said...). Of course, the cross disappeared at the dissolution of the monasteries, so this can't exactly be verified. But a good story, a nice illustration of a Danish nobleman working for the English church, a great source of pride for Waltham - and all because of some stubborn oxen. It's the end of the summer now, but here's a rather belated poem on a summer holiday - or rather, an August honeymoon - by Coventry Patmore. Or stare with looks estranged? And show'd perchance my pride. Round as your own gold ring. The brasses and the tombs. Within your great sweet eyes. Rose higher than the last. One holding up your frock. From you, or from the sea? Within the heart such peace? A drizzling rain set in. And who hath found love's citadel unmann'd? We've come back to Robbie Burns already! This is much less obscure that the Scotch songs I've posted so far, and not exactly in need of me to promote it - but all the same, I love this. The almost-unrelated picture is Dicksee's 'The End of the Quest'; I just found it and will probably be using it to illustrate pretty much every post from now on. You have fair warning. The number of boatmen, fishers, and half-sailors in the Western islands, is out of all proportion to the rest of the inhabitants; especially on the margin of the thousand creeks and inlets and arms of the sea that calmly nestle in the land. 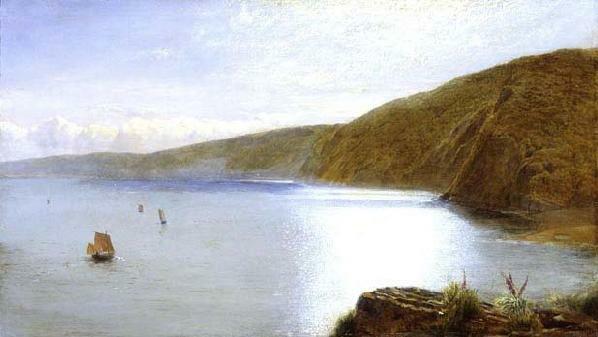 When night is falling on the long and winding loch that leads to a murmuring fishing village, the heavy sound of oars is heard incessantly along the silent shores; or in the summer twilight, when the wind is favourable, many and many sailing-boats may be seen gliding silently, as ghosts, over the smooth, hill-sheltered floor of the fresh western sea-way. Then the far-carried sound of voices comes to the wanderer on the bank, and reminds him, as he looks into the dim gloaming whence they issue, of the mysterious paths that are on the great ocean. Sometimes wild storms overtake the fisher, and anxious hearts wait for him at his home. Sometimes a fierce mountain squall leaps like a wild beast upon him, as he passes by in his careless security, and drives him far away from his warm and blazing hearth; or, as I have known more than once to happen, overturns his frail bark, and sinks him in the hissing, tumbling waters. Where the fishers have large boats they go a great distance, and remain for weeks away. Very frequently they take a voyage or two abroad, and all of them are at least half, and many of them thorough-bred, sailors. The fishing population and the agricultural population differ a good deal in their dress, and a little even in their appearance; of course their associations are dissimilar. The fishermen are a very much respected class, however; and no doubt they think a good deal of themselves. It is of one of them the following very popular song treats. This "Man of the Boat" had gone over the sea, and was like never to return. He had left some one behind him, who mourned his absence greatly. 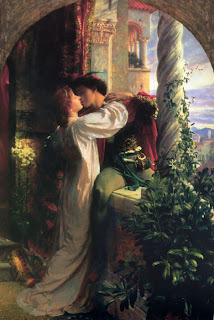 Wilt come to-night, love? Wilt come to-morrow? Or ever come, love! to comfort me? With frequent tear-drops mine eyes o'erflow. Wilt come to-night, love? May I expect thee? Or, sighing sorely, the door put to? I question fondly thy friends, and ask them. Where last they saw thee? where thou art now? That sends me homeward with burning brow. And seek to change me; but all in vain. And every morn yet I watch the main. The ring of gold with thy hair and portrait? I stroll'd beside thee, and thought thee dear. Yon little streamlet roll back the sea. When, all forsaken, she dies alone! 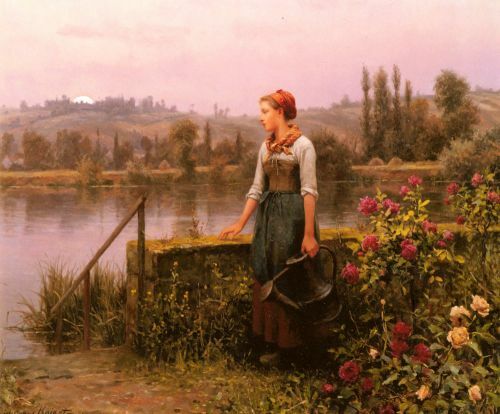 with the note: "Fhir a bhata" (pronounced 'Ear a vata') means 'O Boatman'. Na horo eile is merely a call. 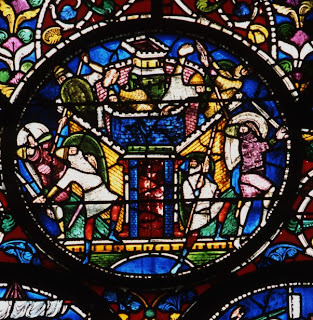 This is a rather upmarket version of 'medieval people in modern stained glass', because instead of the usual efforts of anonymous Victorian artists, we are concerned today with the work of Augustus Welby Pugin. Pugin, a Catholic convert and one of the leading figures of the Gothic Revival in England - most famously, he designed the Palace of Westminster - settled in Ramsgate, on the coast of Kent, in 1844. He designed a church there, right next door to the house he had built for himself (the house has recently been restored, beautifully, and you can stay there). And I went to visit it and took some photos. I like this window very much - especially those colourful tiles, and the little flames of the candles on the altar. This strikes me as an unusual addition to the story, and although it was perhaps included to make up the round number of eight scenes, it is of course symbolic of the (re)founding of the English church. 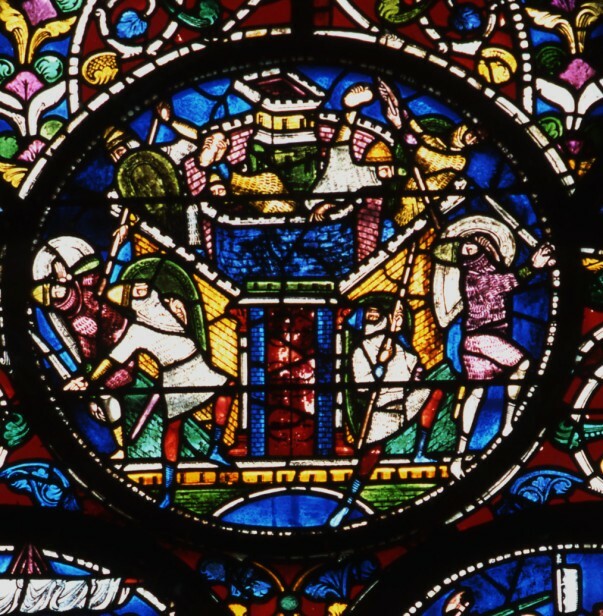 Building and rebuilding churches was one of the earliest things the Gregorian mission did, but since the first Canterbury churches to be given to them were pre-existing buildings, I wonder if this scene represents the laying of the foundation stone of the monastery of St Peter and St Paul, which was later, after Augustine's death, to become St Augustine's Abbey. This would have an obvious significance to the monks who served Pugin's church - the Canterbury St Augustine's is today in ruins (alas! ), and the Ramsgate St Augustine's must have been intended as a kind of rebirth, an heir to its ancient heritage. 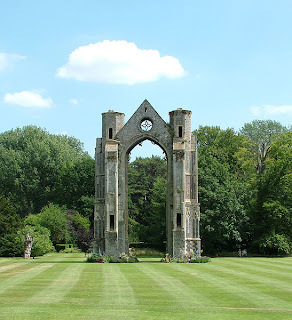 The monastery at Ramsgate was the first Benedictine monastery to be built in England after the Reformation; the monastery at Canterbury the first Benedictine monastery in England, full stop. No wonder its foundation had particular importance here. I couldn't get a very good picture of it, sadly, but the figure on the right is my own favourite Mildred of Thanet, another local saint, with her deer. 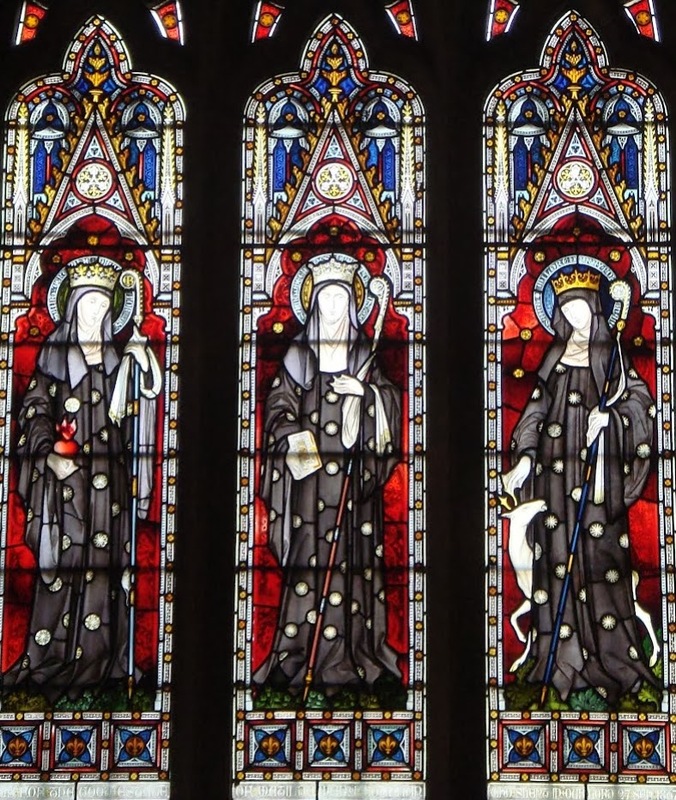 (If you were wondering, the other two are St Gertrude and St Mechthilde). 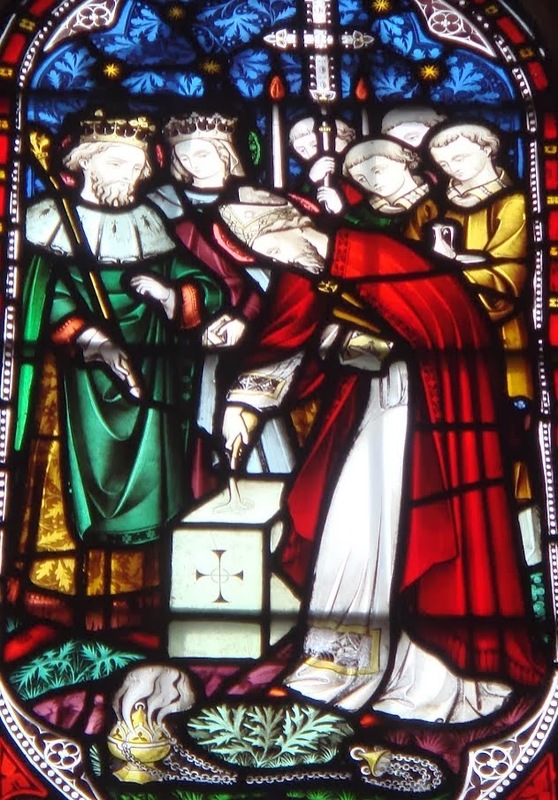 Let's finish with this lovely window of three northern saints, Bede, St Wilfrid, and St Cuthbert (holding the severed head of St Oswald). 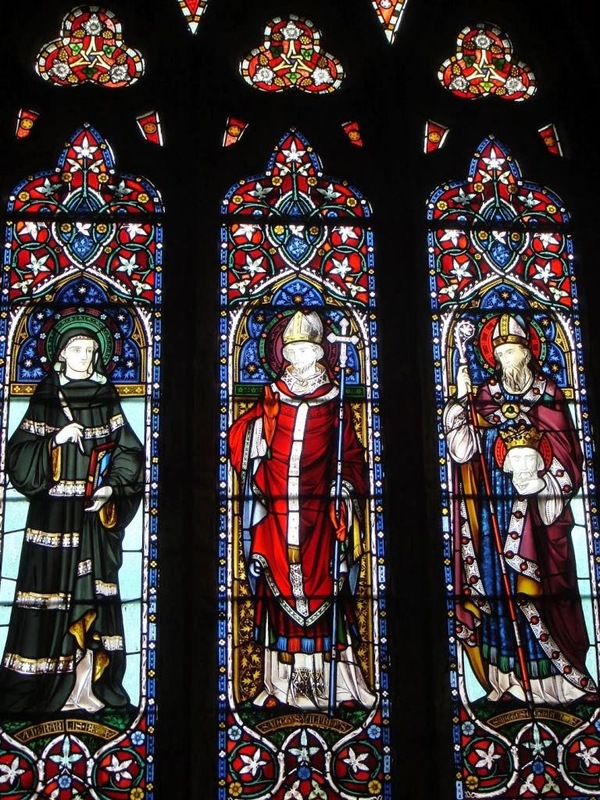 These are of course three of the greatest saints of the Northumbrian church, and thus a suitable complement to the depictions of Augustine, Mildred, Ethelbert and Bertha - champions of southern Christianity. 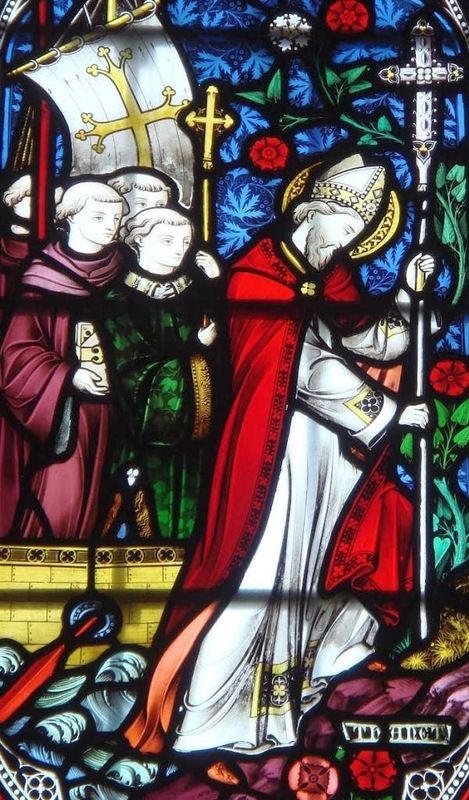 However, they're also appropriate because Bede, Wilfrid and Cuthbert were the names of three of the first monks to live at St Augustine's in Pugin's time. I like depictions of Bede as a younger man - before he was Venerable!